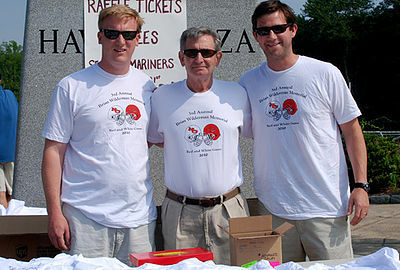 In This Photo: Brian McIntosh (left) and Mike Adair flank Brian Wilderman’s father, John, during the Brian Wilderman Memorial Red-White Spring Football Game in 2010. In 2008 the New Canaan Football Program dedicated its annual Red & White game in honor of one of the greatest student-athletes to ever walk the halls of New Canaan High School, Brian Wilderman. Brian was a natural leader, a loyal teammate and friend. The Red & White Game is a celebration of his life and has become a part of the Ram Football Tradition as one of the most anticipated events of the year. Every New Canaan Football player, past, present, and future will know the story of Brian Wilderman and the man he was. Brian was elected as a Captain in his senior year where he led the Rams to a State Championship appearance in the fall of 1996, en route to garnering All-State honors as a linebacker. It wasn’t only on the football field where Brian excelled, he was a dominate wrestler. He finished his wrestling career as a three-time State Champion, two-time FCIAC Champion, and the State Open Champion in 1996. He placed two different times at the New England Championships. He finished his career with an overall record 114-14, including a record of 78-1 at dual meets. Former Athletic Director Vincent Iovino dedicated a plaque that rests on the wall outside the entrance of the wrestling room at New Canaan High School in Brian’s honor.